These are the cards that I wish I didn't have to make: sympathy cards. And sadly, I needed to make three of them this weekend. For this one, I used two of the new In Colors: Coastal Cabana and Baked Brown Sugar. It's a very simple layout. Even without changing the paper and colors, this could pass for almost any occasion. I mailed out all of the In Color Mini Samplers on Monday. (If you missed out on the free Mini In Color Samplers, but sure to check out my new catalog Product Shares here.) I wanted to include cards that used the new In Colors and I was inspired by a card that I saw on Pinterest that used the negative butterfly punch image. Here's my take on it. The card is 4-1/4" x 4-1/4". I used a 4" x 4" piece of Designer Paper from the new In Color Background Patterns pad. They Whisper White cardstock on top is 1-1/2" x 4-1/4". I punched the Elegant Butterfly from the Whisper White cardstock and the punched a Bitty Butterfly in the cardstock to coordinate with the designer paper. A Jumbo Rhinestone was the perfect bling to accessorize this card. I wasn't worried about the bump for mailing since this card was going in a larger package, but you could always add a piece of bubble wrap over it to help even it out. I love it when Stampin' Up! listens to our feedback and we see change!! Many people have requested that the new color markers be sold individually so that if you only need one or two (like Smoky Slate and Soft Sky) to complete your collection, you could get just those one or two. Well, Stampin' Up! listened!! For a limited time, from June 26 until October 31, you can buy any of the new colors in the pack or on their own! Go ahead, fill in the missing pieces in your collection or buy the whole lot. Click here to Shop Now for new Markers in my Online Store. And while you're re-organizing your marker set, be sure to print out the new insert for your Many Marvelous Markers box to organize your colors in the new color collections. Every month, Stampin' Up! automatically adds a couple new projects to the Art Gallery on my business website. Check out one of the new samples posted this month. Can you spot all the new products? Click here to visit my business website for a list of supplies and project details. 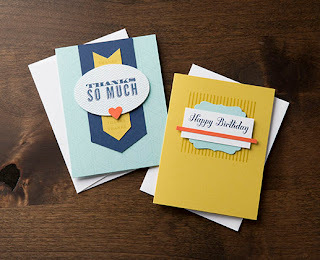 When I looked for masculine card ideas to share with my Stamp Club for Father's Day, I came across a card by Amy Celona and knew it was perfect! It's not only easy, but you probably have everything you need to make it already: cardstock, designer paper, and a Paper Trimmer! Be sure to watch my video tutorial at the end of this post! You can keep it simple or embellish it with buttons from the Vintage Trinkets set. This card would be perfect for Father's Day, Retirement, Graduation, or as a masculine birthday card. You can make this card in five minutes! No joke! Watch me from start to finish in this video tutorial. It's not a huge update, but make sure to check out the new additions to the Clearance Rack! There are some fabulous deals to be had!! Click here to Shop Now. 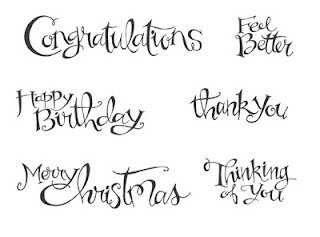 While you're shopping, make sure to "Grab Your Greetings" -- three of our most popular greeting stamp sets are 25% off until June 30! Click here to find them in my Online Store. I've heard the request many times from customers at workshops -- they love the look of handmade cards, but don't have time to make them! Well, now is your chance!! Stampin' Up! is piloting a new program called Ready. Set. Send. Cards. You can purchase handmade cards that are done and ready to send! Each package includes 5 Thank You Cards, 5 Birthday Cards, and 10 Whisper White Envelopes. Available while supplies last in my Online Store. If you like purchasing completed handmade cards, be sure to check out my Stamp of the Month Club! You'll get a new clear mount stamp set and three handmade cards each month! Learn More. 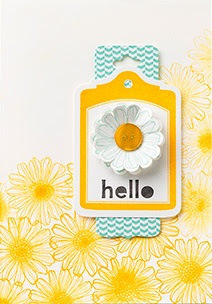 Here are some of my favorite cards using the Sassy Salutations stamp set. Click on image photo to see the original post and project details. Yesterday, I posted a Mosaic Madness card that is part of my Stamp of the Month Club series for June. (See it here.) It made me realize that I never posted the video for last month's Clockworks card! I love last month's cards too! In fact, I have an extra set of cards made up, so if you are interested in getting last month's kit, please send me an email! I am officially mad for mosaics!! Honestly, I wasn't so sure about this stamp set the first time I saw it. But you know me and coordinating products, once I started playing, I fell in love! So much so that I choose to feature the Mosaic Madness stamp set in my June Stamp of the Month Club! Learn more about the club here. It's not too late to join and get the June kit, which will include this card and two others! I punched a piece of cardstock with the Fancy Flower punch as the base for my mosaic flower. It gets completed covered up, but it was perfect to help me space the mosaics. And I used two more mosaics for leaves!